MAY 2003... THE TURNING POINT IN THE HOPI and BIBLICAL PROPHECIES? May 7, 2003 - During the week of May 7, 2004, nearly five years have elapsed, just as the now-dead Hopi elders predicted on the Art Bell Show on June 18-19, 1998, since Hale-Bopp concluded its appearance in the Northern Hemisphere. "It is far the brightest and largest comet seen," Paal Brekke, SOHO deputy project scientist, told SPACE.com. The comet was discovered in November 2002 by NASA's Near Earth Asteroid Tracking (NEAT) program. May 25, 2003 -- Israel approves roadmap - JERUSALEM The Israeli cabinet on Sunday narrowly approved the US-backed peace roadmap, which calls for a Palestinian state by 2005. CONSIDER: 1 Thessalonians 5:2-4 -- For you yourselves know perfectly that the Day of the Lord so cometh as a thief in the night. For when they are saying, "Peace and safety," then sudden destruction cometh upon them as travail upon a woman with child, and they shall not escape. But ye, brethren, are not in darkness, that that Day should overtake you as a thief. March 2004... a new red planet is discovered exactly where "Planet-X" was predicted EXACTLY WHERE Nancy Lieder's Zeta Reticulan friends said it would be discovered, but somewhat later then they said it world. The point is, it IS there, and IT IS RED... just as predicted. CONSIDER: Acts 2:20 "The sun shall be turned into darkness, and the moon into blood, before the great and notable day of the Lord come:"
May 31, 2003 In fulfillment of prophecy, the sun appeared over the Middle East and Europe as a "sackcloth of ashes" and "refused to give her light" in a rare "annular" or "ring of fire" eclipse. IT SEEMS THE FINAL TRADITIONAL HOPI AND HOLY BIBLE PROPHECY CYCLE OF DESTRUCTION HAS FINALLY BEGUN! "While we can still see the twins, the comet up there with the two tails (Hale-Bopp)..." "
New Red Dwarf star discovered May 20, 2003... The Purifier? Planet Sedna - Discovered in March 2004... The Purifier? COMET NEAT: Is this the Blue Star Kachina? The Hopi elder said: "Seven years after the appearance would have concluded itself puts into effect the cycle." It was still being seen in the southern Hemisphere as of the year 2000. So when will the seven years actually be concluded? Before the last few traditional Hopi elders passed away very recently, they let it be known that "purification day" would follow soon on the heels of their passing into the spirit world. The "appearance" of Hale Bopp concluded in the Northern Hemisphere in early May 1997, but continued to be seen in the Southern Hemisphere for at LEAST another 3 years. You may find it interesting to note that right after the end of the 6th year period since Hale-Bopp's disappearance in the Northern Hemisphere (which was the first week of May 2003), the beginning of that 7th year witnessed the largest appearance of tornados in the history of tornado monitoring by meteorologists! Then in March of 2004, Planet Sedna was discovered, just EXACTLY where it was predicted that it would be. Richard Mucci of "Out There TV" discovered this fact. Tornadoes tore their way across Kentucky and Illinois early on Mother's Day as they continued a record-breaking count of 434 tornadoes that have been sighted during the first 10 days of May. 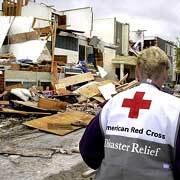 Red Cross workers search for injured persons at a tornado-damaged apartment complex in Morton, Ill., Sunday. "It's the longest stretch of outbreaks that I can recall," said Dan McCarthy, meteorologist for the federal Storm Prediction Center. "It's been an incredible week," said McCarthy, who has been in the weather business for 25 years. The storms broke a record set in 1999, when 188 tornadoes struck the nation from May 1 through May 10. At least 45 people have died in the tornadoes. By comparison, there were an average of 44 tornado deaths per year from 2000 through 2002. ANCIENT PROPHECYKEEPERS - The Trilogy of Ancient and Modern Terrors and Terrorism A NEW RED STAR IS DISCOVERED WHILE A BLUE COMET, THE BRIGHTEST EVER SEEN, IS IN THE SKY! This is an artist's concept of a recently-discovered nearby star. 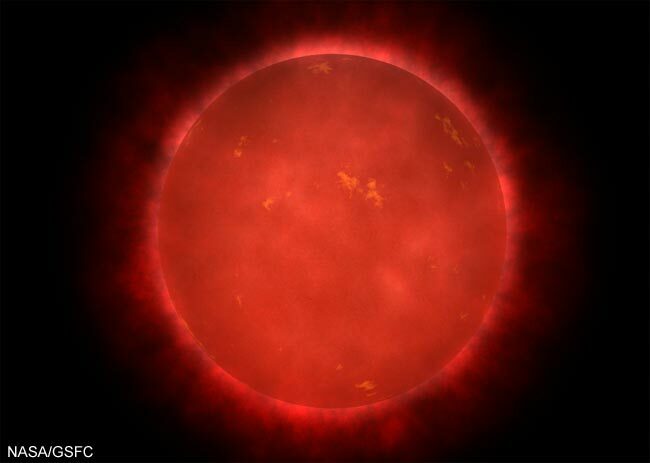 The star, "SO25300.5+165258," is a faint red dwarf star estimated to be about 7.8 light-years from Earth in the direction of the constellation Aries. Click to enlarge. Astronomers have stumbled onto a previously unknown star in Earth's stellar neighborhood, a red dwarf that appears to be the third-closest star system to our own. "Our new stellar neighbor is a pleasant surprise, since we weren't looking for it," Bonnard Teegarden, an astrophysicist with NASA's Goddard Space Flight Center, said in a written statement. Teegarden, the lead author of the study, and his colleagues happened upon the star while searching for nearby white dwarfs, the remains of collapsed stars that quickly traverse the night sky. Astronomers track white dwarfs like they track planets and near earth objects, by tracking their change in position over time. The study of these dead stars can then help estimate the mass and ages of galaxies. "These and other stars make up the tapestry through which near earth asteroids travel, which is our main concern," said Steven Pravdo, who collaborated on the star search, during a telephone interview. Pravdo is the project director for NASA's Near-Earth Asteroid Tracking (NEAT) program, which supplied a database full of sky observations - originally meant to find objects that might impact Earth - for Teegarden to sift through. It was while going through the database that researchers discovered the dim red dwarf, which shines about 300,000 times fainter than the Sun. It's faintness has veiled it from astronomers until now, researchers said. NASA astronomers estimate the newly discovered star to sit about 7.8 light years from Earth towards the constellation Aries. The closest star to Earth is Alpha Centauri, which is actually a set of triplets burning brightly about four light years away. Barnard's Star, the next-nearest neighbor is a slightly further hop at about six light years form Earth. One light year is about six trillion miles (9.5 trillion kilometers). U.S. Naval Observatory is currently taking more observations of the star to pin down its exact distance from Earth. Teegarden's research on the red dwarf will appear in the publication Astrophysical Journal, although a final publication date has yet to be set. COMET NEAT: THE BRIGHTEST COMET EVER SEEN... IS IT THE BLUE STAR KACHINA? The SOHO spacecraft is currently generating spectacular images of a recently found comet called NEAT as the icy body circles the Sun and appears to have been struck by a massive solar eruption. The chance encounter could lead to new discoveries about the interactions of comets with hot, charged particles billowing from the Sun. NEAT is putting on what may turn out to be the most remarkable comet show ever witnessed by SOHO, which has photographed more than 500 comets rounding the Sun. 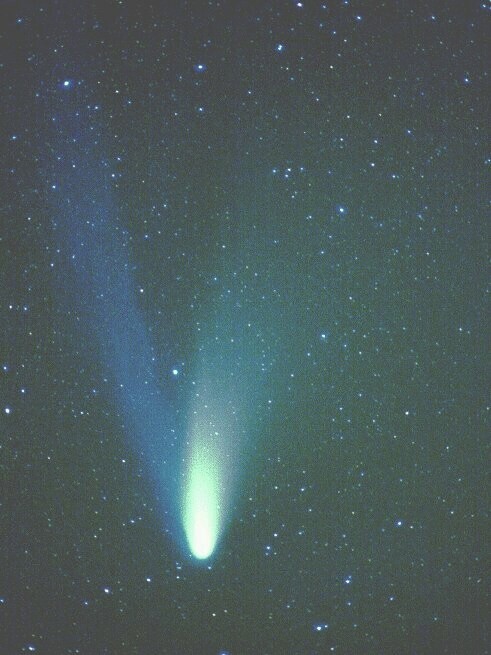 "It is far the brightest and largest comet seen," Paal Brekke, SOHO deputy project scientist, told SPACE.com. SOHO stands for Solar and Heliospheric Observatory. The satellite sits partway between Earth and the Sun and is designed primarily to monitor space weather like the eruption currently witnessed. Live images of the comet and the eruptive event are available at the SOHO website to anyone with an Internet connection. The comet, officially C/2002 V1, should be visible in SOHO's LASCO-3 camera through the pre-dawn hours Thursday. A solar eruption, called a coronal mass ejection (CME), appears to have hit the comet Monday, Brekke said. Scientists think they observed a kink propagating down the comet's ion tail. "Certainly such effects from a CME could give us new information about comets, their tails and how they interact with the solar wind," said Brekke, who works for the European Space Agency out of an office at NASA's Goddard Space Flight Center. SOHO is a joint project between the two agencies. Another eruption lifted off the Sun early Tuesday [as seen in the picture near the top-right of this page] but it's not clear yet which direction it is aimed. NEAT was just one-tenth of Earth's distance from the Sun when it made its closest approach to the Sun this week. Solar energy boils gas and dust from the comet's nucleus. Sunlight then reflects off this fresh material, creating the glowing head and tail of the comet. The tail always points away from the Sun, driven by solar radiation. The comet was faintly visible in the evening sky last week for viewers with dark sky conditions. It has been in LASCO's field of view since Sunday. It will begin to drop out of the picture, in the lower right, at about 4 or 5 a.m. EST on Thursday, Feb. 20. NEAT will then begin a long journey back out into the fringes of the solar system. While Earth orbits the Sun every year, comet NEAT requires about 37,000 years to make a single, elongated loop. Live and archived pictures and animations of NEAT, taken by the LASCO-3 imager, are available on the SOHO website. 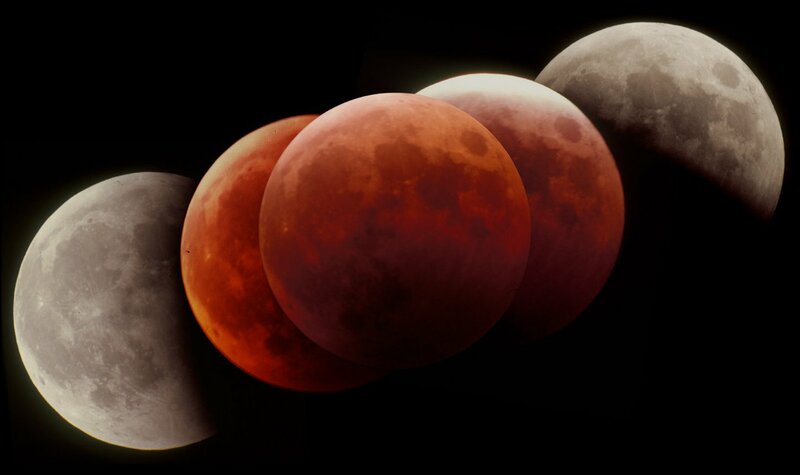 On May 15, 2003, the Moon "turned to blood" as it does on occasion during a lunar eclipse. This happens more and more as atmospheric pollution occurs, but was unheard of when the prophecy was given anciently. S.Barnes: "A friend and I took a last minute flight from Hamilton, Ontario, to escape cloud cover. I took these pictures near Thunder Bay." D. Dockery: "The three images were captured at entry, midpoint, and exit from totality." Photo details: Nikon CoolPix 995 digital camera shooting afocal through a TeleVue 32mm PLOSSL and TeleVue 85mm refractor. On 31 May, 2003, this is what the sun will look as she is "turned into darkness" over the Middle East and Europe during it's almost total "annular" or "ring of fire" eclipse.